Italian piano manufacturer Fazioli have revealed their new generation of F278 concert grands at this month’s NAMM show in California. These instruments feature Fazioli’s latest piano action which is primarily designed to reduce the effects of changes in atmospheric conditions. 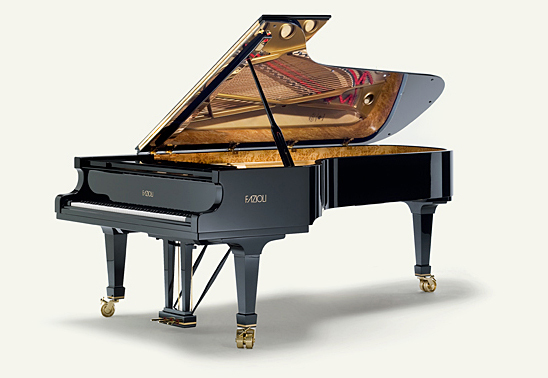 The Fazioli F278, at 9ft 2inch, is a standard concert grand size, and is widely used in prestige concert halls and recording studios across the land. It has been in production since 1982. It was also famously THAT piano in 50 Shades of Gray, on which Christian Gray played ‘Adagio’ from J S Bach’s Concerto in D Minor after Marcello. The piano used in the film, which had some components gold plated, cost just over a quarter of a million dollars. Fazioli’s new design incorporates a hollow aluminium action rail, filled with a wooden multilayer. As well as making the mechanics less susceptible to moisture, the action weight is also decreased. The action also offers more resistance and provides a more solid feel. Fazioli claim that the new design makes the keyboard feel smoother, more responsive, and has greater uniformity.